Technology is moving fast and its just the right time to say goodbye to paper, thanks to the Boogie Board, an LCD tablet that actually is affordable and the perfect way to replace paper pads! Improv Electronics is the manufacturer of this Boogie Board and brings to us technology from Ohio’s Kent Displays, a technology called Reflex LCD which is a pressure sensitive LCD plastic that requires no power to retain what’s written on it and only a small watch battery to erase the screen. 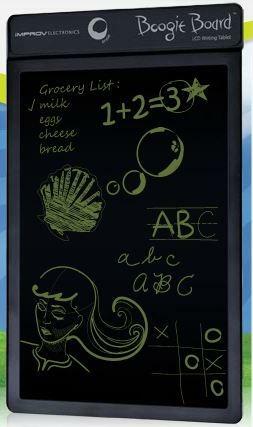 The Boogie Board’s reflex LCD is highly responsive to variable amounts of pressure. Another version where what you write is transferred to the computer is under works which might be a great addition to the board. Boogie Board has experienced a huge increase in demand and is reportedly “trying to keep up” with the influx. The best part is that the Boogie Board is just $30. An inexpensive way to buy an alternative to the paper and claims that one board can be used 50,000 times or more. Well atleast a small start of not having to use paper. You can visit the Boogie Board site here. This is a great write up on the Boogie Board! The guys at Tripping.com are big fans and are giving one away every week this month (http://blog.tripping.com/show-off-your-best-travel-photo-and-win-an-lc). This was such a great description that I used it when tweeting about the Tripping photo contest. I had checked out the website but didn’t realize until I read this article that the Boogie Board only requires a small watch battery. Sweet!